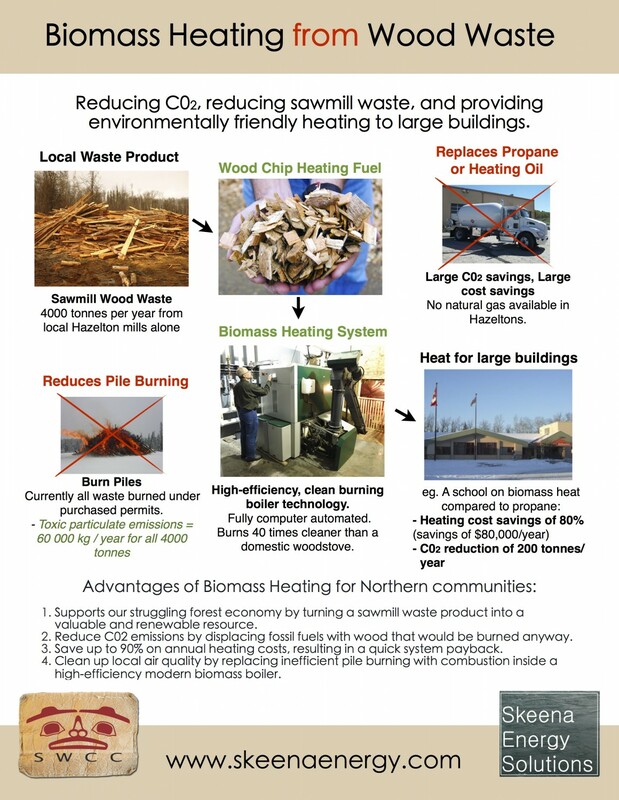 With high heating needs, and a struggling forestry industry, biomass heating is a perfect renewable energy fit for many northern communities. Wood chips that are ideal fuel for biomass heating. A biomass heating system burns waste wood chips in a high-efficiency boiler to heat water that is then pumped via underground pipes to a number of nearby buildings to provide heat. Biomass heating can greatly reduce carbon emissions, clean local air quality, support the local economy, and save money. What other energy solution can do that? Working with a number of Hazelton community groups, we are developing a proposal to heat a number of large buildings in the Hazeltons with biomass derived from local waste wood. This is the biomass boiler at the Telkwa Village Office. It heats the Telkwa Elementary School, 5 houses, a pub, and the Village Office. The 300 kW system uses about 5 semi-trucks worth of wood chips per year, all derived from local wood waste. Why biomass from waste wood? First, the wood used as fuel can often be sourced from situations where it would otherwise be burned anyway, meaning the system contributes no extra carbon emissions, and greatly reduces emissions in cases where biomass fuel replaces fossil fuels. While many large sawmills now use their residuals (wood waste) to make pellets, pulp, or bio-energy, many smaller sawmills in the north still burn waste wood in piles simply because there is little to no market for it. Second, money paid for biomass fuel stays in the local economy (unlike money paid for fossil fuels). If local chips are used, sawmills will be making money for what was before a wasted resource gone up in smoke. Third, modern computer-controlled biomass boilers burn incredibly cleanly. Today's industrial biomass boilers are not your average woodstove, nor are they the smoky backyard boilers you may have seen filling valleys with smoke across BC. A modern biomass system that can heat a school, 5 houses, a pub, and a town office will put out about as much toxic particualte matter (smoke) as one household woodstove. If a biomass heating system reduces inefficient pile-burning at local sawmills (a process that emits large amounts of particualte matter), local air quality is actually improved. Fourth, heating with biomass generally costs half of what it costs to heat with propane, electricity, or heating oil, and can often out-compete natural gas, meaning the system typically pays for itself in under 10 years, and in as few as 2. For example, one situation we are investigating includes a large building that spends $100 000 per year on propane for heating. All this propane could be replaced with $15 000 worth of wood chips per year sourced from local sawmill waste. The system has a projected payback time of 5 years. Insulated pipes carry hot water to each of the buildings on a district heating system. The building owners simply purchase heat, hassle-free, from the heating system owner under an "energy contract." Mostly due to its economic benefits, biomass heating is already common-place in Europe, and has been for decades. In Austria, a world epicenter of bioenergy, the burning of "wood waste" in piles simply never happens (on cut-blocks or at sawmills). All forest products are utilized. In contrast, the BC forest industry burns the equivalent of tens of thousands of truckloads of wood a year (mostly at cut-blocks, but also lot at sawmills and for fire protection around towns and cities). The BC forestry industry involves long trucking distances and market circumstances that make utilizing all wood waste infeasible. However, we could go a long way to using a lot more of it. As one biomass expert from the Bulkley Valley says, "Around here, there is so much waste wood that you could easily heat the valley between Vanderhoof and Prince Rupert. It takes a critical mass of operating systems before people say 'Yes, this is possible.'". If it's going to be burned anyway, why not at least use the heat? Inside the combustion chamber of the Telkwa biomass boiler. Since the cost savings of heating with biomass compared to fossil fuels can be so large, we are working on creating a biomass cooperative that would be responsible for collecting, chipping, and screening waste wood from local sawmills, and delivering high-quality biomass fuel to regional biomass heating systems. This is a niche market that has yet to be developed in northern BC. The Hazeltons region may be an especially well suited location for this enterprise since there is no natural gas available there (meaning all big buildings heat with expensive propane, heating oil, or electricity), and there are numerous local sawmills that burn piles of waste wood every few months. Particulate emissions from biomass boilers are incredibly low. The small white plume in this photo (about as big as from one household woodstove) is from the Telkwa biomass system (which heats 8 buildings). It is mostly water vapour. No natural gas is available to these communities, so all 6 buildings are heated by propane, heating oil or electricity, meaning current heating costs are very high (except the Wrinch Memorial Hospital, which heats with electricity under a special inexpensive E-Plus contract from BC Hydro). 3 buildings are excellent candidates for biomass conversion: The Hazelton Secondary School, the New Hazelton Elementary School, and the Gitxsan Wet'suwet'en Education Society in Gitanmaax. Each system has a 5 - 8 year pay-back time. There is potential for a district system that would heat the Hazelton Secondary School, the planned Upper Skeena Arena, and the Northwest Community College with the same boiler. However, due to distances between these buildings, it may be technically and economically superior to install separate individual systems at these buildings. The wood chips used to fuel the boilers will be purchased from local sawmills where they will be created from waste wood. Delivery will be via truck. This waste wood is currently burned in open piles, and hence the biomass system will not only provide the small sawmills with an extra revenue stream, but will also avoid burn permit costs. We have tentatively partnered with 3 sawmills who will be chip suppliers. There is significantly more then enough waste wood produced locally to heat all 6 of the proposed buildings. No trees will need to be cut down to run these systems. School District 82 is very interested in pursuing the plan, and have applied for funding for the project at the Hazelton Secondary School based on this study. Construction could take place summer 2015. We are pursuing funding avenues with Gitanmaax as well. If you'd like to learn more, or get involved, contact us. Telkwa Feasibility Study & Business Case - These documents give details on sizing, ownership, layout, and financing for the Telkwa biomass district heating system. Wood Waste 2 Rural Heat - The mandate of this organization is to help communities get biomass heating systems up and running in BC. Small Biomass Heating Guide - Well-researched step-by-step manual for communities who intend to install biomass heating systems in BC. Fire in the Woods or Fire in the Boiler? - A toolkit to determine whether wood from wildfire prevention can sustaianably fuel a biomass heating system for your community in BC. BC Bioenergy Strategy - The provincial government's take on bioenergy.